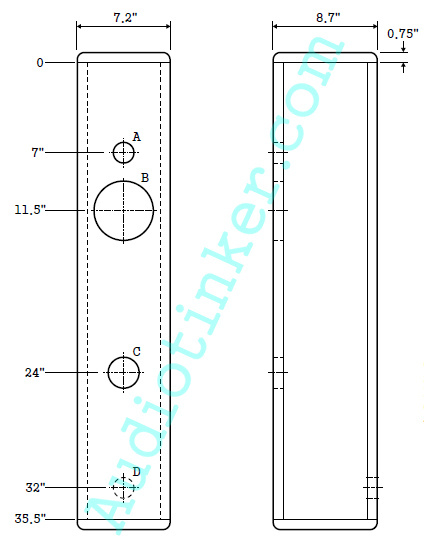 These speaker plans are my original designs and are offered here as free pdf downloads. I've built all sorts of speakers for a long time. For the last several years I've been fascinated by Transmission-line speakers. I typically use Martin King's MathCAD work sheets to model the designs. Not all designs turn out to my liking. Only the best of many years of effort have made it to this list of plans. I don't typically build speakers with inefficient drivers - this unit is only 84.5dB/W/m. The Peerless 830656 is known as a high-value midrange driver, but not necessarily considered a great woofer. First off, it's small which typically spells doom in the LF band. In this design it has been mated with a Mass Loaded Transmission Line cabinet, which brings deep bass in a relatively small footprint. We're talking f3 in the low 30s. Amazing sounding, rugged, inexpensive and relatively easy to build. What is there not to love about this speaker? The plans for this simple MLTL can be downloaded here.